The sheer volume of truly significant automobiles at any Amelia Island Concours is breathtaking, but none more significant than the display of race cars owned and driven by Sir Stirling Moss in 2015, including this lovely 290 MM. It was restored by the Classiche Department at Ferrari in 2014, and was awarded the “The Chairman’s Choice Trophy for the Car Found Most Appealing by the Chairman” in 2015, simply confirming for us Bill Warner’s impeccable taste. 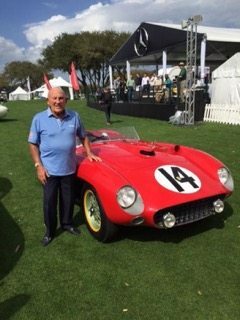 Final approval for the award came from Honorary Chairman Sir Stirling Moss himself, who played a big role in the Ferrari’s impressive race history. Built in 1956 to take part in sports prototype competitions, this 290 MM (chassis 0628M) actually started life as an 860 Monza powered by a large-displacement 4-cylinder. 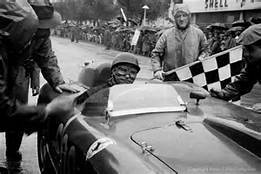 Its maiden race was the Mille Miglia in which it competed as an official works car, finishing second overall at the hands of Englishman Peter Collins. Photographer Louis Klemantaski served as co-driver, documenting the 1,000-mile race with his camera along the way. 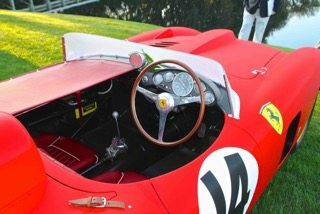 That same year, the Ferrari also came second in the Coppa d’Oro delle Dolomiti with Olivier Gendebien and Jacques Washer as well as third in the Targa Florio, with Hans Herrmann and Gendebien, and in the Aosta-Gran San Bernardo in the hands of Italian driver, Umberto Maglioli. 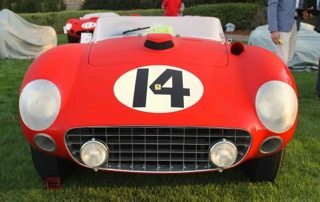 At the end of 1956, however, Enzo Ferrari decided to replace the 4-cylinder engine with a 12-cylinder and the car was renamed the 290 MM. It made its debut at the Buenos Aires 1,000 Kilometres in January during which Wolfgang Von Trips, Peter Collins and Eugenio Castellotti drove it to third position. Years later, the 290 MM embarked on a second career, competing in the classic car races like the Mille Miglia Retrospective and Monterey Historics, in addition to honored spots on display at both the Pebble Beach Concours and Cavallino Classic. Chassis 0628M through the years underwent major modifications after an accident, but eventually it was sent directly to the Classiche Department for restoration to its original form. 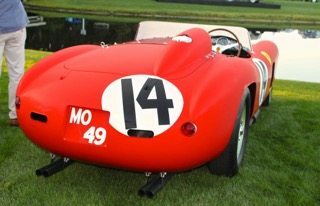 It appeared at the Amelia Island Concours d’Elegance in 2015 wearing its number from the 1957 Sebring 12 Hours, as raced by Phil Hill and Wolfgang von Trips.